Florida leads the country when it comes to percentage of the elderly population - 23 percent in all, according to the Pew Research Center. In fact, the Sarasota region ranks as one of the most senior-populated counties in the U.S., with about 34 percent of the population here over the age of 65. Senior drivers are known to have higher rates of both crashes and injuries, for a number of reasons. Despite the fact that mature drivers are less likely to be drunk, speed or text while they drive, they are more likely to be cognitively and physically impaired in ways that pose dangers to both themselves and others. The U.S. Centers for Disease Control & Prevention (CDC) reports more than 5,7000 older adults (over 65) were killed and 236,000 were treated in hospital emergency rooms for crash-related injuries. Seniors today are more active than ever. Many still hold jobs, they volunteer with religious and community groups, they travel and some even care for older parents. Engagement in these activities mean they are still reliant on their cars well past the age of 65. 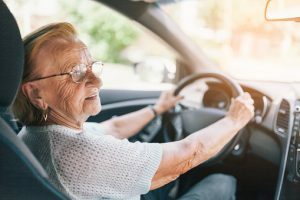 It's believed that the number of drivers over age 65 will reach 72 million by 2050 - a substantial increase from the 48 million expected to be on the roads by 2020. Here in Florida, F.S. 627.0652 requires insurers to offer discounted rates to insureds 55-and-older who successfully complete motor vehicle accident prevention courses, as approved by the Florida Department of Highway Safety and Motor Vehicles. This can be renewed every three years, though insurers can require that beneficiaries not be involved in any accidents or plead guilty to moving traffic violations. In addition, all drivers over the age of 80 who are in the process of renewing their licenses may be required to pass a vision test, which can be taken at the DMV at no additional charge. Eye doctors can also conduct the test and submit the HSMV 72010 form to the department for review. Our Bradenton car accident lawyers recognize that while no single uniform test can provide a complete picture of driver fitness, it can help to identify drivers who may need additional scrutiny. Consumer Reports recently analyzed some of the risks faced by older drivers. We can't overlook the fact that crash rates rise once drivers hit the age of 70. Still, even drivers who are 85 crash less often per mile than teen drivers. Even then, in most cases, they pose the greatest danger to themselves. One study published in the Journal of the American Geriatrics Society found that senior drivers were more likely to commit numerous minor errors (i.e., failing to signal) and ones that were dangerous (i.e., running a red light) than middle-aged drivers. Research indicated in-person license renewals and additional vision tests for older drivers were an effective means at reducing car accident fatality rates. At this juncture, only six states require doctors to report potentially dangerous patients to state licensing authorities and medical advisory boards. Others, like Florida, make such reporting voluntary. The state of Florida last year revoked 6,700 driver's licenses for "mental incapacity" or "failure to provide a requested medical form." An additional 3,900 drivers were denied licenses or renewal requests for either failing a vision test or not supplying the vision test report.